Department of Pediatrics, Faculty of Medicine, King Abdulaziz University, P O Box 80215, Jeddah 21589, Kingdom of Saudi Arabia. *Address correspondence and reprints request to: Mohammed M. Jan, Department of Pediatrics, Faculty of Medicine, King Abdulaziz University, P O Box 80215, Jeddah 21589, Kingdom of Saudi Arabia. Al-Youbi R, Jan MM. Burnout Syndrome in Pediatric Practice. Oman Med J 2013 Jul; 28(4):252-254. Objectives: Burnout is a common work-related syndrome consisting of emotional exhaustion, depersonalization and diminished feelings of personal accomplishment. Burnout influences the performance and efficiency of the healthcare professionals and therefore the quality of the care provided. This study aims to assess the burnout rates and potential determinants in pediatrics. Methods: A cross-sectional, descriptive study involving physicians practicing pediatrics in the Jeddah area of Saudi Arabia was conducted utilizing the Maslach Burnout Inventory in addition to questions regarding work-related and lifestyle-related factors. Results: One hundred and thirty pediatricians (55% females) were included with age ranging between 25 and 45 years (mean: 30). Most (46%) were consultants and 54% practiced in a university based setting. Burnout scores were abnormal in 107 (82%) and in 45 (34%) the syndrome was severe. Males were more likely to reach a severe burnout category compared to females (40% vs. 31%; p=0.012). Academic pediatricians working in a university setting were much more likely to experience severe burnout compared to their counterparts working in other hospitals (50% vs. 19%; p=0.0005). Consultants were also more likely to experience severe burnout compared to residents and assistants (46% vs. 27%; p=0.03). Conclusion: At least one third of practicing pediatricians suffer from burnout syndrome. Specific strategies should be developed and implemented to limit and prevent professional burnout. Keywords: Burnout Syndrome; Pediatrics; Child; Practice. Burnout is a common work-related syndrome consisting of emotional exhaustion, depersonalization and diminished feelings of personal accomplishment.1-3 Affected individuals are unable to cope with emotional stress at work with negative, cynical feelings and attitudes toward their colleagues and patients. They often feel unsatisfied with their work and accomplishments.4 The prevalence of burnout syndrome is higher in professions that are physically demanding or those requiring higher levels of commitments with stressful work environment.5 Examples of these situations include supervisory positions, surgical or procedural services; and intensive or emergency care services.6-8 All these situations frequently apply to pediatricians working in various services. Some pediatric subspecialties can be more emotionally draining than others including nephrology, oncology, and neurology.8-10 Pediatricians have to deal with children who have chronic incurable conditions associated with multiple problems. They have to interact with their stressed and often fatigued parents. Burnout state influences the performance and efficiency of the healthcare professional and therefore affects the quality of the care provided often unconsciouly.11 Providing such quality medical services is quite costly and therefore such problems could have significant implications.12 Studies on the issues of burnout syndrome have been very limited, particularly in our region. The purpose of this study is to assess the burnout rates and potential determinants of burnout in a sample of practicing pediatricians. We hypothesize that many pediatricians are suffering from burnout syndrome, thus we plan to explore the contributing and correlating factors of burnout state in order to alleviate its effects and help improve the work environment. A cross-sectional, descriptive study involving pediatric physicians in the Jeddah area of Saudi Arabia was conducted over 3 consecutive months, in 2010. Pediatricians at various levels were enrolled into the study including residents, assistants, and consultants. They practiced pediatrics at various major hospitals in Jeddah, Saudi Arabia, including university, private, military and service hospitals. 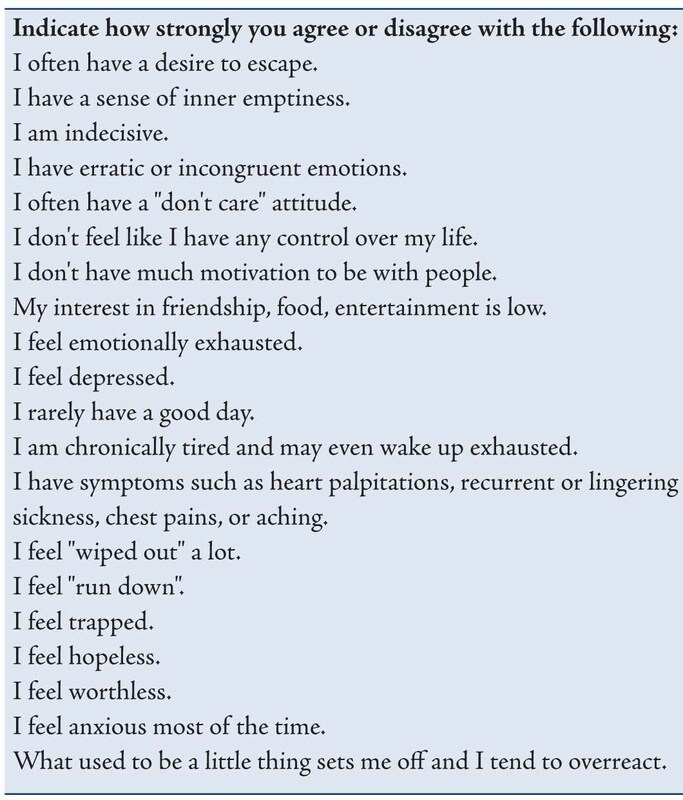 Burnout symptoms and their severity were evaluated using the Maslach Burnout Inventory, which examines three domains including emotional exhaustion, depersonalization symptoms and level of personal accomplishment at work.4 The original English version was used and examples of key questions are listed in table 1. Table 1. 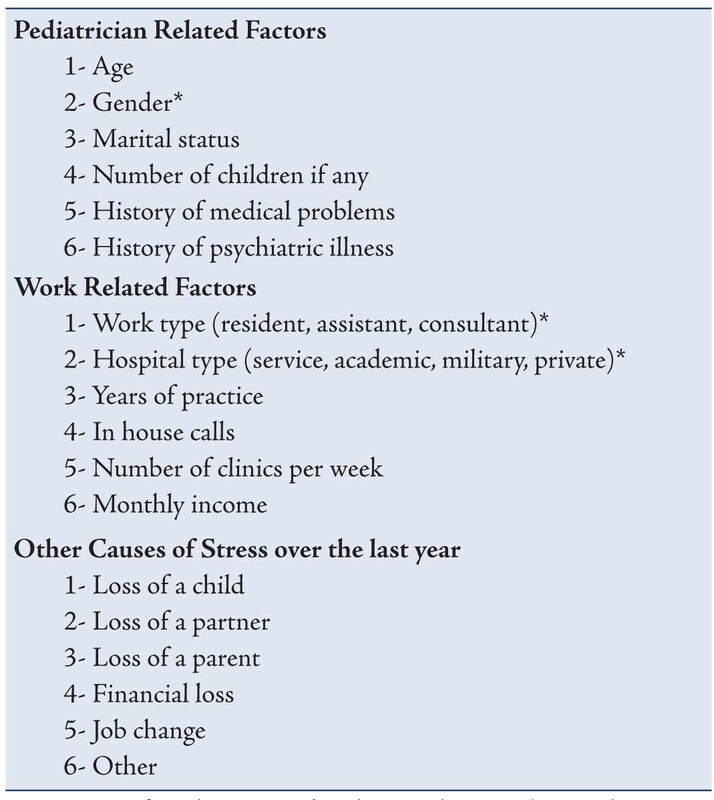 Demographics, as well as questions based on work-related and lifestyle-related factors associated with developing burnout syndrome were included (Table 2). King Abdulaziz University hospital ethics committee approved the study design and questionnaires. One author personally distributed the questionnaires (hand to hand) to maximize the response rate and subsequently collected the data. Before consenting for the study, all participants were assured that the study is completely voluntary and the provided information will remain confidential. Statistical analysis of the data was done using SPSS 17 (SPSS, Inc., Chicago, IL, USA). Descriptive analyses were performed and the variables were examined using chi-square test. Statistical significance was defined as p<0.05. Table 1: Key question included in the burnout inventory. Two hundred questionnaires were distributed and 130 (65%) were returned. Of these, 130 pediatricians, 55% were females with age ranging between 25 and 45 years (mean±SD: 30±5). Most of the pediatricians (72%) were married and 53% had children ranging in number from 1-11 (2±2.4). The study participants were comprised of consultants (46%), residents (31%) and assisstants (23%) who completed their pediatric training. All participants were practicing in various pediatric disciplines with years of practice ranging between 1 and 32 years (10±9). The majority (54%) practiced in either an academic or university based setting with varying monthly income. The burnout scores were abnormal in 107 (82%) of the included pediatricians and were significantly abnormal (severe) in 45 (34%) as shown in Table 3. Three of the examined variables correlated with burnout status were as follows: gender, job category and hospital setting (Table 2). Males were more likely to reach a severe burnout category compared to females (40% vs. 31%; p=0.012). Academic pediatrician working in a university setting were much more likely to have severe burnout compared to those working at other hospitals (50% vs. 19%; p=0.0005). Finally, consultants were more likely to experience severe burnout compared to residents and assistants (46% vs. 27%; p=0.03). Age, marital status, years of practice, and income had no correlation with burnout status. Also, the number of in-house calls and clinics per week had no significant correlations. The results also showed that 19% of the participants had other significant stresses in their lives (Table 2); however, this factor was not reflected in their burnout scores. This was also true for those with history of other medical (24%) or psychiatric (3%) illnesses. Table 2: List of factors that were assessed to correlate with severe burnout. *Factors significantly associated with severe burnout (p<0.05). Table 3: Burnout scores and their severity among the study sample (n=130). Based on the current study and all reviewed literature, burnout is a significant problem that must be addressed and highlighted in the pediatric work environment. Specific strategies should be developed and implemented to limit and prevent professional burnout, keeping in view its effect on patient safety. This is particularly relevant in our region where this problem has not been well studied.18,19 In one study, it was revealed that burnout in pediatrics had significant negative implications including conflict with the managing policy, poor work satisfaction and some respondents even considered leaving their job in the future.13 Pediatricians may develop negative attitudes toward self and professional activity, and eventually lose interest in pediatric care, have low productivity and diminished self-esteem. Several facts can be used to develop such strategies. Routine exercise (a strategy used by some for stress reduction) was associated with lower burnout scores.6 Physicians who reported satisfaction with their lives outside of work were less likely to have burnout.8 Therefore, social and community involvement should be encouraged. The availability of a forum for debriefing, and services for pediatricians affected by burnout were both associated with lower rates of burnout.8 Further research is needed on the development, implementation and effectiveness of interventions aimed at preventing and treating work-related burnout. We conclude that at least one third of pediatricians practicing in the Jeddah region are suffering from burnout syndrome. Specific strategies should be developed and implemented to limit and prevent professional burnout. 1. Maslach C, Schaufeli WB, Leiter MP. Job burnout. Annu Rev Psychol 2001;52:397-422. 2. Teng CI, Chang SS, Hsu KH. Emotional stability of nurses: impact on patient safety. J Adv Nurs 2009 Oct;65(10):2088-2096. 3. Della Valle E, De Pascale G, Cuccaro A, Di Mare M, Padovano L, Carbone U, et al. [Burnout: rising interest phenomenon in stressful workplace]. Ann Ig 2006 Mar-Apr;18(2):171-177. 4. Maslach C, Jackson SE. The measurement of experienced burnout. J Occup Behav 1981;2:99-113 . 6. Fields AI, Cuerdon TT, Brasseux CO, Getson PR, Thompson AE, Orlowski JP, et al. Physician burnout in pediatric critical care medicine. Crit Care Med 1995 Aug;23(8):1425-1429. 7. Balch CM, Shanafelt T. Combating stress and burnout in surgical practice: a review. Adv Surg 2010;44:29-47. 8- Roth M, Morrone K, Moody K, Kim M, Wang D, Moadel A, Levy A. Career burnout among pediatric oncologists. Pediatr Blood Cancer 2011; 15;57(7):1168-73. 9. Horiguchi T, Kaga M, Inagaki M, Uno A, Lasky R, Hecox K. An assessment of the mental health of physicians specializing in the field of child neurology. J Pediatr Nurs 2003 Feb;18(1):70-74. 10. Jan MM. Perception of pediatric neurology among non-neurologists. J Child Neurol 2004 Jan;19(1):1-5. 11. Reader TW, Cuthbertson BH, Decruyenaere J. Burnout in the ICU: potential consequences for staff and patient well-being. Intensive Care Med 2008 Jan;34(1):4-6. 12. Al Rashdi I. How much the quality of healthcare costs? A challenging question! Oman Med J 2011 Sep;26(5):301-302. 13. Bustinza Arriortua A, López-Herce Cid J, Carrillo Alvarez A, Vigil Escribano MD, de Lucas García N, Panadero Carlavilla E. [Burnout among Spanish pediatricians specialized in intensive care]. An Esp Pediatr 2000 May;52(5):418-423. 14. López Franco M, Rodríguez Núñez A, Fernández Sanmartín M, Marcos Alonso S, Martinón Torres F, Martinón Sánchez JM. [Burnout syndrome among health workers in pediatrics]. An Pediatr (Barc) 2005 Mar;62(3):248-251. 15. Pistelli Y, Perochena J, Moscoloni N, Tarrés MC. [Burnout syndrome among pediatricians. Bivariate and multivariate analysis]. Arch Argent Pediatr 2011 Apr;109(2):129-134. 16. al-Asnag MA, Jan MM. Influence of the clinical rotation on intern attitudes toward pediatrics. Clin Pediatr (Phila) 2002 Sep;41(7):509-514. 17. Ringrose R, Houterman S, Koops W, Oei G. Burnout in medical residents: a questionnaire and interview study. Psychol Health Med 2009 Aug;14(4):476-486. 18. Al-Turki HA. Saudi Arabian Nurses. are they prone to burnout syndrome? Saudi Med J 2010 Mar;31(3):313-316. 19. Sadat-Ali M, Al-Habdan IM, Al-Dakheel DA, Shriyan D. Are orthopedic surgeons prone to burnout? Saudi Med J 2005 Aug;26(8):1180-1182.